This journey is a key component in my ongoing desire to reach the highest point of every county in Colorado. I plan an entire month driving and highpointing on a single trip from California to lower transportation costs - expenses now quite large due to mushrooming gasoline prices. However the psychology of climbing for such an extended period concerns me. To lower the degree of effort below some unexplored "burnout threshold", I split the journey into two parts with a Denver stay in the middle. At Denver I enjoy life as tourist - a hat that I have yearned to wear on previous highpointing forays yet was unable to owing to work-imposed constraints on vacation allowance. During my journey I climb with several people, each with their agenda, perhaps less grand than my own, yet nonetheless just as important to them. 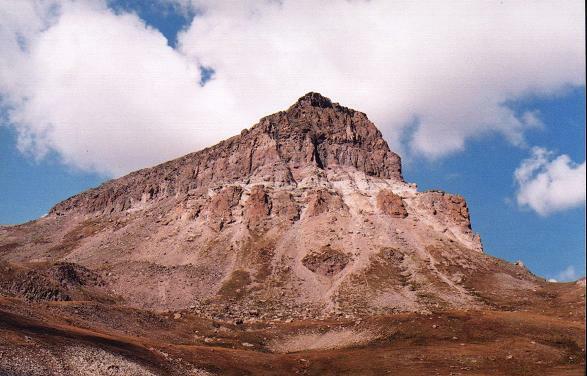 Most memorable, and, certainly most arduous, is an ascent of Castle Mountain - the Carbon County, Montana highpoint. Distanced from Colorado, this climb is included because Betty and Jerry Brekhus of said county invited me on a joint effort for already one year. The original itinerary called for a guided ascent of Grand Teton, along with Tim Worth, in addition to the Colorado and Montana venues. The climb is cancelled for reasons beyond our control. My intention is to visit the highpoints of all but one of the remaining Colorado counties. 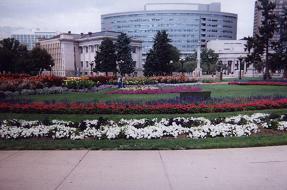 In turn I wish to complete the state, in winter, on Mount Lincoln of Park County at the state's very center. Said plan serves the dual purpose of allowing the first Colorado state completion in the winter; and as essential cold weather training for a tentative climb of Mount McKinley next June. I begin the journey with 53 of Colorado's 64 county highpoints behind me. Thereby I plan upon ten of the remaining eleven counties - again, all but Park County. Mount Lincoln is selected as the single holdout because, with gentle slopes, it is climbable by winter with minimal avalanche threat; at 14,286 feet is a revered Colorado "fourteener"; has nearly 4,000 feet of topographic prominence; and, far from least, became the national highpoint after the Louisiana Purchase's boundaries were adjusted in an 1819 treaty with Spain [David Olson, private communication]. Note: Colorado mountains have been well documented. 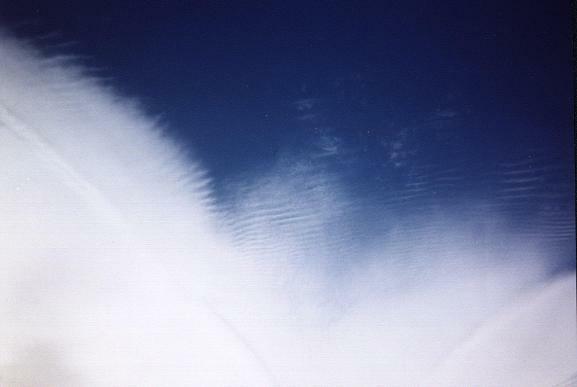 The photographs of this report are largely limited to road travel and touring. 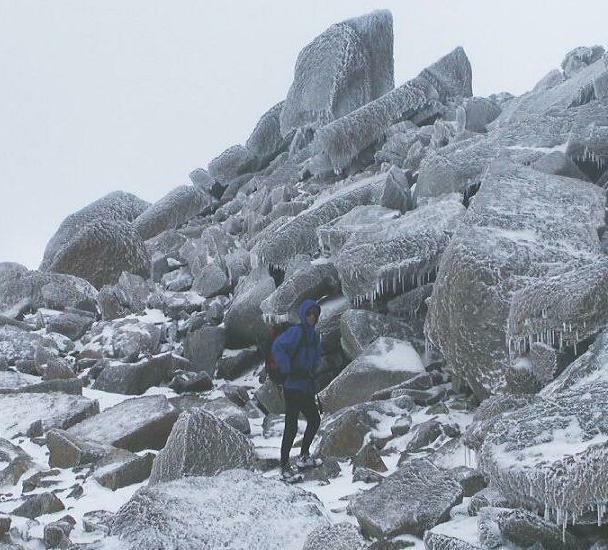 Photographs from some ascents are included in various county highpoint trip reports via hyperlink. A summertime road trip from San Diego to southwestern Colorado necessarily travels through desert country with intolerably hot temperatures - especially for sleeping in a camper. Stopping at nearly 7,000 feet in Sunset Crater National Monument buys one 20 degrees of coolness. My site is on a Forest Service road a few tenths mile south of the main loop road that takes one, over 32 miles of pavement, through both Sunset Crater and nearby Wuputki National Monuments. I am one mile directly east of Sunset Crater itself - which currently off-limits to hikers due to concerns about the resulting deterioration of crater features. I frequent this site enroute to Colorado as there is no water to be had - and thus mosquitoes are completely absent. Sleeping at nearly 7,000 feet also provides some altitude acclimatization. A short driving day - all of 300 miles into southwest Colorado. Arriving around 1 p.m., I perform errands and, later, rent a motel room in Durango instead of camping. 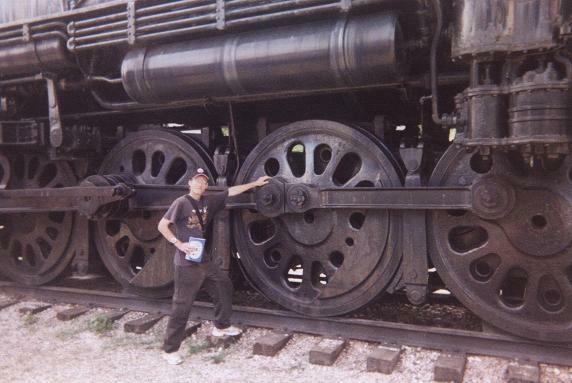 This is done for several reasons - I must be at the downtown railroad terminal next morning; the afternoon is young and there'd be little to do at a campground; and non-RV camping sites are at least 15 miles from town. Nowadays there are more camping parks for large recreational vehicles than for the minimalist car camping I am used to. To me the camping is merely a means to the goal of reaching a mountaintop. For the masses of RV users the camping IS the end goal - replete with dining tables, satellite dishes, and, most disturbingly, electric generators. Call that "getting back to nature"? - A sham. 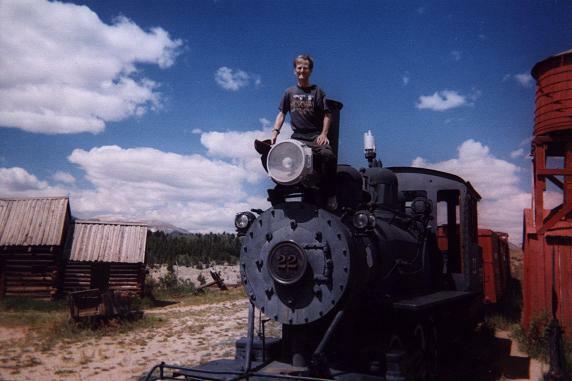 The ascent of La Plata County's highpoints normally begins with a most unusual venue - a train ride on the Durango and Silverton Narrow Gauge Railroad. Backpackers and climbers, in the minority among both the elderly and the Japanese tourists, are summarily deposited at the Animas River footbridge some 32 miles and 2 1/2 hours from Durango. The rail option is climber-unfriendly as early morning hours are not in the train schedule. Tim Worth appears well in-time for our 9 a.m. departure, and we look forward to eventually erecting a camp high in Chicago Basin for the twin climbs of Mount Eolus and Windom Peak the next day. At 14,083 and 14,082 feet in their respective elevations, these two peaks are too close in height for stating outright that one of them is the county highpoint. Both are climbed from the same high camp. Our efforts are described in this trip report. 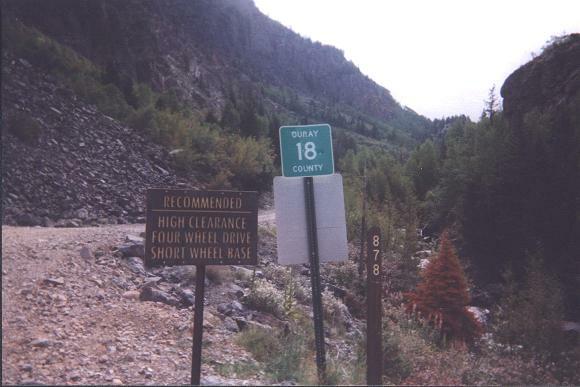 Upon return to Durango we drive the "Million Dollar Highway", as Route 550, north to FR585 - the Forest Service approach road for climbing Vermilion Peak. We do this ostensibly to shave-off driving distance for the next day. I ask Tim if he's interested in doing Vermilion tomorrow - after all, we are right there and the forecast is decent. He is not interested - an unfortunate decision with unwelcome consequences for my overall Colorado plans. Tim and I caravan to the trailhead for Mount Zirkel, the Routt County highpoint in northern Colorado. Arriving in Montrose around 8 a.m., I stop at a supermarket to enjoy a pair of Edward's chocolate mousse pie slices - my reward for Eolus and Windom instead of the usual ice cream pint. Meantime Tim examines maps in his cab. We arrive about 3 p.m. at our trailhead with little to do but have a liesurely conversation - followed by supper in short order. The standard afternoon sprinkle only slightly mars our enjoyment of the day. <?p> There is one aspect I look forward to upon completing the Colorado county highpoints - should I choose, I never have to suffer through habitual afternoon rain again. ONLY COLORADO with its high altitude and position within the summer monsoon flow is most vulnerable of all the western states. I really like Colorado - but when your hiking day is essentially finished by high noon you begin to wonder. Mount Zirkel lies in true wildnerness. Tim and I climb it over the morning and early afternoon, the entire effort lasting eight hours and being most enjoyable. A brief note provides fresh details about this climb. The day's adventure being complete, Tim and I part ways after driving to the nearest gas station. Tim is very low on gasoline and I drive behind him in case of the worst. After passing through Steamboat Springs, I continue east to the two wheel drive trailhead for Clark Peak, the Jackson County highpoint. The Colorado State Park remote site camping fee sets me back $12 when combined with the entrance fee. In the evening I note the mosquitoes hover some five to ten feet above my truck's engine hood, forming a cloud of activity that never interferes with my own affairs as I eat supper on the tailgate. Likely they are attracted to the residual engine heat. I climb Clark Peak by morning, and, although it is windy on the summit ridge, the skies are still fair and I have enough clothing to continue unabated. I arrive just after another man who, upon conversation, wishes to learn more about the route taken. So I show him the Colorado highpoints guidebook, and, after pointing out Dave Covill's handwritten signature, he notes that Dave trained him in crevasse rescue methods the previous winter. The man leaves soon lest his wife worry in their rented yurt far below. The climb consumes six hours total, and, finished by noon, I have plenty of time for driving into Wyoming, and, owing to the early hour, take a room in Rawlins along Interstate 80. A discount market on the main drag's north side features a large tray of snack foods at great discount - just 10 cents for any item. I buy 50 items ranging from Doritos tortilla chips to duplex cookies to high-protein performance bars (these often sell for over one dollar each) - and all for just five bucks! Motels on the west side of town are all run by Indian immigrants (the subcontinent); are all overpriced; and, at least at my motel, don't always get the most savory of customers. A drunken brawl in the parking lot was avoided when the police car arrived. You'd think for $65 that something better could be had. In review - don't stay in Rawlins' west end but do attend that supercheap market. This is mother's birthday. The cell phone works along much of Wyoming's state highways as I provide descriptions of my driving route to settle her mind. The largely boring ride is enhanced with talk shows on the radio, e.g. KTWO Casper, Wyoming (1030 kHz). I particularly enjoy Rush Limbaugh - arch conservative and protector of rational thought. Finally I reach Cody in the state's northwestern quadrant. I call the Brekhus home to get their estimate of how far from a certain junction to the trailhead. Voilà - I receive an invitation to sleep at their home in Red Lodge, Montana. This unanticipated windfall is greatly appreciated - as I had intended all along to just sleep at the trailhead and meet them the next morning. 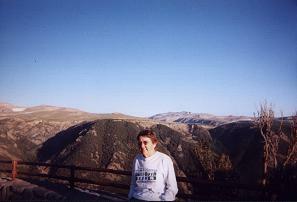 Betty at a Beartooth Highway pullout. 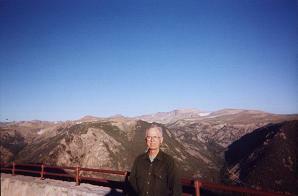 Jerry at the Beartooth Highway pullout. Driving into Montana becomes the farthest from home my truck has been. Indeed, Carbon County is the farthest county from San Diego I have thus far climbed, having gotten there entirely by my own devices, i.e. as distinct from flying and renting - or driving as passenger. Dinner at their favorite restaurant is both filling and enjoyable. That experience along with the ensuing four-day ascent of Castle Mountain is described in this trip report. Please see my trip report for details of this backpack and climb of Castle Mountain. Back at my truck a quarter past two, I drive the Beartooth and Chief Joseph Highways into Cody. The pint of Ben & Jerry's Black and Tan ice cream, a new flavor, was certainly earned. It features rich, chocolate ice cream swirled with beer-flavored vanilla ice cream (!). The beer taste derives from malt extract. Adding some honey makes it tastier still. Cody, Wyoming features these amazing clouds. This day features a 490 mile drive to meet my motel reservation in Denver. The American Motel is cheap enough if one makes two-week advance reservations. Again, I elect to "take it easy" for a while in order to avoid losing interest in endless climbing and driving. I am assigned to room 310 on the north side, that is, the side not facing Interstate 70. "310" is a good one - it is both the number of counties I finished 2005 with; and the designation of my favorite twin-engined general aviation plane - the Cessna 310. The TV remote does not work - ehh! I have to, for goodness sakes, get UP and manually push the TV buttons. Maybe I am a couch potato at heart..... nah! There is a Super Target just 0.2 mile north - a regular Target discount store to which they've added a supermarket. I attend this venue multiple times over the next week. Each morning I get free danish in the lobby - cheese, apple, cherry flavors. Sometimes the tray is empty when I arrive. To solve, I return several minutes later after the staff has re-filled it. My truck gets the standard check every 3,750 miles at a local Toyota dealer. I overdo the free waiting room doughnuts and coffee, topping it off with an ice cream sandwich. I've clearly lost weight and need more calories for the journey's balance. in Golden. Note the massive ironwork. 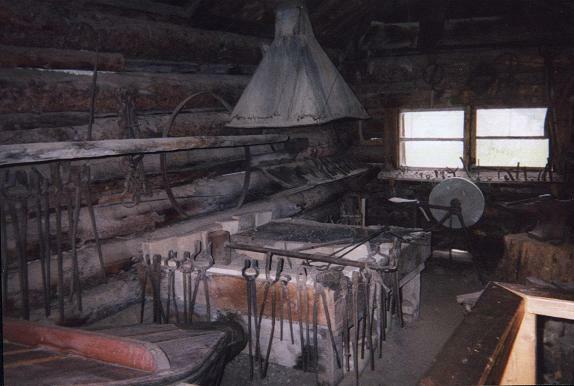 I revisit the Colorado Raiload Museum in Golden just west of Denver proper. A one hour tour lends more insight into the region's railroad history than inspection alone would have provided. I make a sneak visit to John Mitchler's home - but find him, reasonably, to be away at work. Then I drive to the American Alpine Club Library (AAC), also in Golden, and request to see my prominence book ("The Finest Peaks") kindly donated by Richard Carey. My book sits atop the desk of one lady charged with classifying books into the Library of Congress decimal system. As the only book of its genre, she could not figure out in what category it should be pigeonholed - e.g. mountaineering, geology, or whatnot. It had been sitting there for months as she was in a true quandary. I suggest discussing the matter with her. After a half hour of consideration we categorize the book under mathematical geology - there being no more apt description in the Library of Congress's outdated and overly formalized system. One cannot simply "invent" a new topic or category - an existing category must be employed. We decide upon a geology categorization rather than a climbing classification (again, a choice between the two HAD to be made) because climbing is merely an APPLICATION of prominence concepts - other fields potentially benefiting from prominence include ecology, hydrological engineering, and planetary exploration. The underlying theory exists independently of the climbing pursuit; has strong mathematical underpinnings; and thus our decision - one that the librarian has the power to authorize, through her computer, throughout the world wherever a library must decide where to shelve the book. 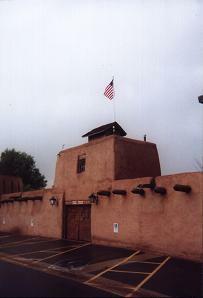 The Fort Restaurant is modeled after a nineteenth century military outpost with an adobe construction and matching high prices. I have reservations for Sunday at 5 p.m. However the weather is looking just awful - bad enough to delay an ascent of Larimer County's Hagues Peak, with Tim Worth, until possibly the very same day. I therefore cancel the reservations and order take-out to be enjoyed in my room. The appetizers are most unusual - I concentrate exclusively on them. Thus the "Historian's Platter" contains an array of treats: fatty bison sausage; jalapeño peppers stuffed with peanut butter cream; Rocky Mountain oysters (do you know what these really are? ); a large amount of guacamole with tortilla chips; and bison tongue - a true delicacy. I also order (for $15.95) a dish described on the TV Food Channel - bison marrow bones on toast. Absolutely delectable. You scrape out the fatty marrow, spread on the buttered toast; and all is served with Hawaiian red sea salt and much tarragon as flavor and garnish. Ready to burst from much of this, I had finally made good the caloric deficit. My only regret is not the amount of food enjoyed - I am simply too skinny to worry about THAT - rather, that the meal cost me some fifty dollars! 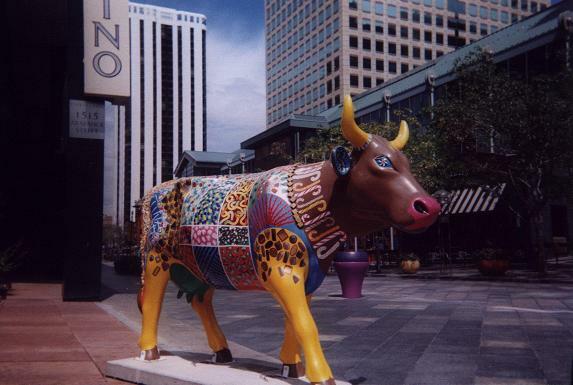 This venue is a "must" for any Denver tourist or passer-by with several hours to use. I lived in Denver from 1967 to 1969 - age seven to nine. My mother claims that as children we were taken there every Sunday. She says to look for the dinosaur at the front entrance - and, sure enough, Tyrannosaurus Rex greets me near the ticket counter. The best exhibit is perhaps the new hall devoted to space exploration. There I discuss with helpful volunteers the recent demotion of Pluto to a "dwarf planet". After a slice of pizza plus a yogurt and granola parfait from the cafeteria I continue to explore the remaining exhibits. I left around 4 p.m to beat rush hour - and find that driving north to Interstate 76 and then west to its junction with Interstate 70 is likely less congested at peak hours than having gone west the obvious way - straight on Interstate 70. Today was the tentative climbing date for Hagues Peak with Tim Worth. A storm system precludes any sane attempt until Monday. Larimer Square and the Sixteenth Avenue Promenade do not prove interesting - to me. I spend ninety minutes in a downtown Barnes and Noble bookstore, eventually purchasing a neat book on acoustical and musical engineering. The Denver Mint is closed to tourists on weekends - and I did not care to pay $8 for the Colorado History Museum. I did, however, enjoy their gift shop with its numerous books; finally purchasing, trivially, a lime cream soda pop. I am a sucker for nearly any new and interesting food or beverage. In the final analysis, food is relatively cheap compared to other items that people might buy on a whim. This justification settles my mind - although spending fifty dollars for bison appetizers does stretch the concept of "cheap". In the morning I drive north along some of the approach route for Larimer County the next day. Here, the aim is familiarization with the highway system before having to negotiate them at three in the morning. On return from Boulder I enjoy brunch at Denny's with Kathy and John Mitchler. Refills on hot chocolate make my chocolate cream pie nearly superfluous - and the stack of pancakes in addition to my main dish, a "Creole egg scramble" with sausage, serves well later as base for assorted items in my room. The waitress comes through with ensuring a good amount of cheese for the egg dish. GO CHEESE! We retire to my abode for a laptop presentation of John's recent expedition to the highpoint of Kobuk Valley National Park in Alaska - Mount Angayukaqsraq (4,700+ feet). The grizzly bear threat is very, very real there - and the sheer remoteness makes for an epic tale. I arise very early for the ascent of Hagues Peak. Details of our efforts are described in this trip report. Prepared for an afternoon with the acoustics book, Lanny W. appears in the lobby to bag the four county highpoints of the Denver metropolitan area. Along with his friend and climbing buddy, we hit these four locales, completely by automobile, over some four hours. Approaching my motel, now twilight, I suggest enjoying lox and bagels with cream cheese in my room instead of ordering meals at some restaurant. Being from New York (and Jewish), Lanny's friend accepts the plan - and I quickly find the needed supplies at the Super Target I have frequented the entire week. We also have pastrami and pumpernickel. This brown bread with smoked salmon is simply grand. If only I had some chopped onion! After years of worrying, Lanny finally climbed Mount Elbert on August 28 - so abolishing his distrust of anything over 14,000 feet and opening the floodgates for a slew of additional, western state highpoints in his future. Highway 285 takes me over Kenosha Pass and drops me in Fairplay - seat of Park County. I drive through Alma, the highest town in North America at 10,578 feet, and, along Route 9, photograph the various ridgelines leading up Mount Lincoln for my winter climb. from Alma - Spanish for "soul". Mount Lincoln lies directly behind Bross. On return to Fairplay I visit the South Park Museum for two hours. The $6.50 admission price is a bargain since this 1880s reproduction of a Colorado mining town is extremely complete in detail. The Smithsonian could not have done better - especially as the museum is on-site. The drive southwest to Buena Vista is short - only some 35 miles. 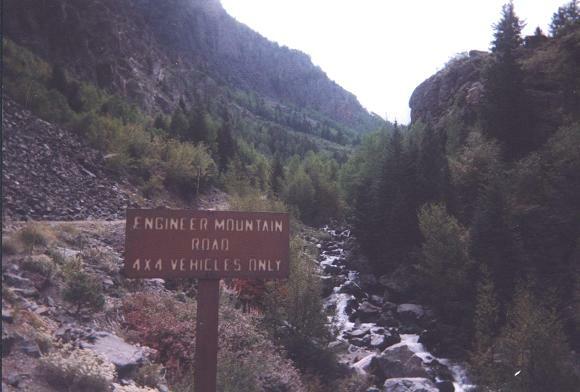 There I leisurely enjoy some ice cream before heading along the deteriorated Forest Service approach road for climbing Mount Harvard of Chaffee County. I climb Mount Harvard with a 4:45 a.m. wake time and a 5:24 a.m. start. Coffee does wonders at these times - even if only cold with milk over Frosted Flakes. The top 50 or 100 vertical feet is scrambling on enormous boulders - so I left my pack at their base and finished-off this hike nearly weightless. 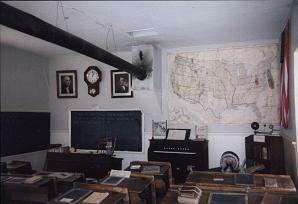 South Park Museum in Fairplay. WHAT VIEWS! It is wonderful to have a Colorado fourteener all to myself on a summer day. Other hikers pass by only upon taking my "summit" break at a large cairn near 13,200 feet. It starts to rain upon return to my truck, about 1 p.m. - with thunder in the peak's direction. Those irresponsible hikers - caught as usual on the summit ridge during a thunderstorm. I don't like getting up in the dead of night - but, hell, that's the way to climb these peaks and live to tell the tale! I approach Crestone at the western base of the Sangre de Cristo Range. This town is bizarre - a potpourri of counterculture - nothing is "normal" about this enclave. "Fifth Dimension Reality", palmistry, raw food preparation - you-name-it: if it is weird and counterintuitive you'll find it here! A $9 fee campground is located one mile north of town. Having lost the last site to another traveler, I find an obscure road leading left (northwest) off the main approach road right at the national forest boundary. A flat parking area, obviously used previously from the empty beer cans, serves as free lodging for the night. I awaken to investigate the approach route for the Cottonwood Lake Trailhead. The trailhead is at the end of a short, 0.2 mile side road leading east (left) from the main road that goes southeast through a housing development owned by the Manitou Foundation - a Buddhist organization that, among other projects, is intent on closing down all access to this side of Crestone Peak. 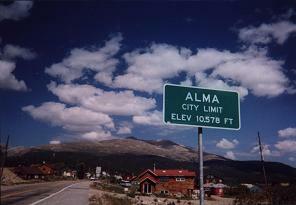 I return to County Road "T", drive west to Highway 17, and head south to Alamosa. There I check the weather forecast at the public library; and enjoy a pint of Ben & Jerry's Turtle Soup ice cream. This new flavor features a vanilla base with fudge and caramel; cashews and a caramel swirl. Granola bar sections, assorted dried fruit, and peanut butter add to the fun. 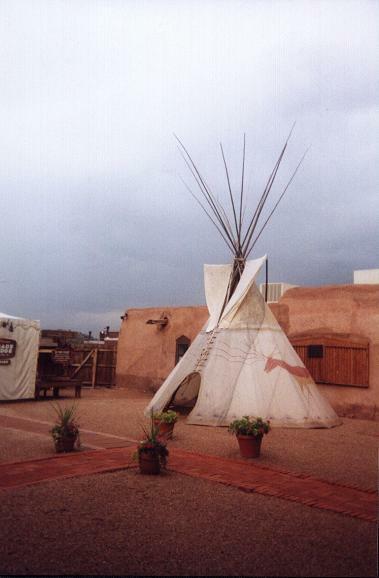 I return to Crestone, and, backtracking four miles west, take a bunk room for all of $26.20 at the White Eagle Inn. I highly recommend this establishment - it is cheap, clean, and in general you get the entire room to yourself because it is off the beaten track. Run by Buddhists, this is a strange place. Guided by their philosophy there are neither telephones nor televsions in the rooms. There is, however, a communal kitchen with a large refrigerator, a real stove and oven, pots and dishes with utensils, and a dining table. Just clean after use! The central courtyard's swimming pool is gone - replaced with a rock garden that glows at night with neat lights that form a shining path. In fact rocks seem revered here. They are "everywhere". At the front entrance oblong, upright rocks "greet" you as if people standing on their toes. Rocks adorn pedestals. Rocks form circles and spirals on the ground. And the rocks probably "speak" to you - at least in somebody's religion. I ate two entreés that evening - both an individual pizza and salmon filet stuffed with spinach and cheese - and all bought at Albertson's of Alamosa. I receive extra stamina the day after overeating - I did this before backpacking to Castle Mountain as well and for the same reason: carrying an overnight pack for me is very, very arduous. I meet John and Stacy Sype for our ascent of the Crestones at the exact location designated the previous day - 0.1 mile west of the trailhead proper. Details of our backpack and climb are described in this trip report. Delighted with the White Eagle Inn, I return there for the night. Really, folks, this is a good value. After supper I retire to my room next door, only to hear a couple preparing their meal in the kitchen. Curious, I strike a conversation and learn they believe in extraterrestrial beings, firmly, and claim to have dealt with them personally. Not wishing to upset them (they had just offered me a slice of leftover pizza), I went along with this nonsense. Evidently the huge San Luis Valley has long been a sanctuary from menacing forces - be it marauding Indian bandits - or, nowadays, the conjoined efforts of society-at-large to silence those with alternative viewpoints. The couple left for their 8:45 p.m. meeting with ET. I visit Black Canyon of the Gunnison National Park mid-day. The canyon is called "black" only because little sunlight penetrates down the nearly vertical walls. The exploration history of this canyon, and the canyon itself, makes for an interesting tale of geology. However the Grand Canyon is overwhelmingly more impressive. In the visitor center I am poised to purchase Gerry Roach's excellent book on the Colorado fourteeners. At $19.95 it is a bargain given the wealth of detail contained. However I ask myself, "Will you really USE this book?" The answer, uncertain as it is, suggests that impulse shopping is for the irrational soul - not mine. Through Montrose I make my way to the trailhead for Mount Sneffels - the Ouray County highpoint. Edward Earl arrives in his signature blue Nissan pickup truck about 6:30 p.m. The conversation lasts three hours until well after dark. Edward and I climb Mount Sneffels without a hitch. The weather is quite fair - the best, in fact, seen yet in Colorado this trip. We drive "the long way" to Hinsdale County, i.e. through Montrose, then U.S. Highway 50, south on Route 149, and then Lake City. 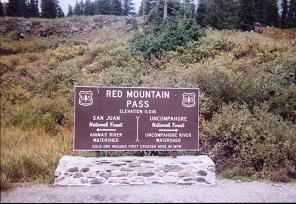 We camp on CR20 right at its junction with the road leading to the four wheel drive (4WD) trailhead. A man parks and inquires about conditions up the latter road. The young Asian American, reed thin, is skeptical whether he should risk it ... and yet with a full set of fourteeners on his plate, camping as low as we are will not cut it. The next morning I note his truck at the 4WD trailhead. Although I see Asian Americans on occasion along the trail, it is extremely rare for me to see Black Americans. Only once in fact - starting up the trail for Grays and Torreys as Tim Worth and I returned to our cars last summer. This must be a "culture thing" - I sense no discrimation in the backcountry. After supper we trivially walk down the road at least eleven vertical feet. In so doing we secure a net 5,000 feet of elevation gain for Uncompahgre Peak the next day - for the trailhead to summit elevation difference is 4,989 feet. Someday the county highpoints group might approve of allowing a route-dependent 5,000+ foot records category - and we hedge our bet by downclimbing a mere eleven feet. I insist on leaving early - 5:30 a.m. - in light of afternoon lightning hazard and the sizeable, 5,000 foot elevation gain with corresponding time requirement. In reality we depart at 5:18 a.m.
view of Uncompahgre taken on our descent. The climb is uneventful, and consumes roughly 4 1/2 hours to gain the summit. The weather - good enough - although it has been cold for much of the climb because the sun was hidden behind morning clouds that refused to burn-off. Fourteener Wetterhorn is a mere two miles west. Mount Sneffels is seventeen miles west southwest - and, although I did not know that distance at the time, we do know that it is "close"; and, further, that it is a shame a more efficient means of getting between the venues is not currently feasible without an ATV or risking vehicle damage. 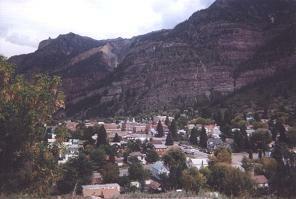 A rapid descent follows, and we are back at the trucks just after 1:30 p.m.
Ouray the town and tourist trap. Chief Ouray was an influential Ute Indian chief. Rain ruins our laid-back, casual style. So we drive in the freakin' rain the five miles back to Lake City. We consider a motel room but there is so much daylight remaining that it makes more sense to part ways - Edward going south on Route 149 and I north to Montrose for the night. I had been considering a shortcut to Ouray and Silverton, as the Alpine Loop, but an auto parts store dealer says it will "chew up" my Tacoma. So I take the long way around. By now I am sick of Highway 50 east of Montrose - I have driven it five or six times on the last few trips. However the hot chocolate feels good indeed! I know the manager at the Sky Trails Motel in Montrose, and he remembers me from the previous year. The room's microwave oven and TV entertain me just fine. I plan this as a "day off" - standard procedure after a 5,000 foot day. That proves to be a mistake as the weather turns foul, in fact, downright rotton, the very next day. Red rhodochrosite - manganese carbonate. Most of these minerals, and certainly the rhodochrosite, are from the Sweet Home Mine near Alma of Park County. Sweet Home is world-famous for its rhodochrosite specimens, with the largest single crystal on display at the Denver National History and Science Museum (I know - I saw it!). 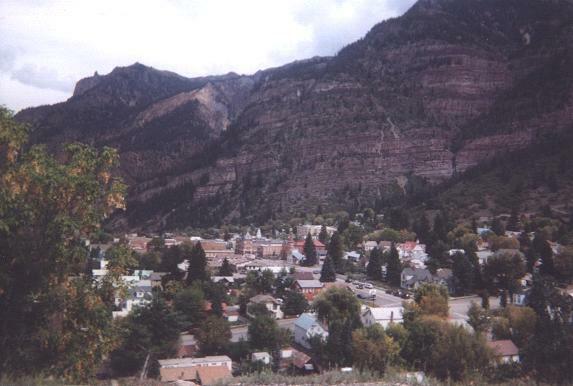 between Ouray and Lake City. I intentionally select these minerals because they hail from the very county where I intend to complete the state. Until I actually do so the rocks sit in my closet, hidden from view and enjoyment until I have earned the privilege. The juxtaposition of red, yellow, and green minerals is most pleasing - but, again, I will not enjoy that sight until the appropriate time. One highlight is the cheddar fries topped with chili at the Pickle Barrel restaurant in Silverton. I enjoy this at a quarter of three just before they close for lunch - whence I drive to the by now familiar FR585 for camping the night. I will not spend $14 at the organized campground, right near the trailhead, just for a toilet and a park bench. As trailhead parking lot camping is prohibited, I simply sleep 0.7 mile down the road at a broad pullout. "Don't try this at home, kids." 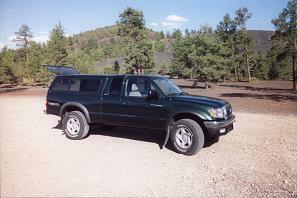 It rains from 2 p.m., while still in Silverton, clear through the afternoon while at my truck. Worse, it rains again at 7 p.m., at 8 p.m, and then, as the really bad sign, nearly all night after 12. I am very worried about the next day since with this much rain the snow will be heavy higher up - and a single day will not be enough to melt it away. A break in the rain at 7 a.m. allows me to reconfigure my gear for driving; and I head to Silverton for a big decision. Shall I stay around two solid days for the rain to end - only to hike a trail covered in snow and, worse still, negotiate a summit block buried in the stuff? Shall I stay an additional day to let the snow melt - so making for three days of doing nothing - or rather, nothing productive? I figure that a winter ascent of Vermilion Peak is a better use of my time than eating cheddar fries. There is that salmon steak on the Pickle Barrel's menu ... and the whiskey-laced bread pudding for dessert. I promised myself both for lunch were I to stick around... but, let's face it: what would I do the rest of the day? along Route 550 - the Million Dollar Highway. The rain is incessant. I decide to drive south on Route 550, directly into New Mexico, in order to lose elevation faster than going west on Highway 160 through Cortez. I reason that much of the precipitation is due to orographic uplifting - and that rain will largely cease upon reaching lower terrain. Ship Rock is visible as I finally stop to enjoy a few minutes in the sun. Yes - it rained considerably through the Farmington area. Flagstaff is my end-goal for the day. Interstate 17 from Flagstaff to Phoenix is not fun. The thunderstorm is so strong; the rain so forceful, that I along with half the drivers stop on the shoulder to let the road drain. It is too dangerous to drive now. Then, tuning to KTAR Phoenix (620 kHz), "Sky Harbor Airport reports sunny skies - with a forecast for more sun today". 09gji034t9ju 0[pat9u34nfg!! SCREW THEM. IDIOTS. Skies clear west of Phoenix on Interstate 10, and remain so for the duration of my drive home on Interstate 8. Driving through sand dune country of Imperial County, California, my thoughts turn to the summit ridge of Hagues Peak but twelve days earlier - a larger climate contrast in one trip would be most interesting! Here is my completion map resulting from this - my longest peakbagging vacation ever. The "doughnut hole", as Park County in central Colorado, was envisioned years ago, around 2004, when I started seriously working on the state's county highpoints. I had estimated that on average there is a 90% probability of any given county highpoint being successfully visited. Of eleven counties attempted this means an expectation value of 0.90 x 11 = 9.9 counties on which success occurs. The holdout, San Juan County's Vermilion Peak, is stark testimony to these cold calculations. Indeed, using the binomial expansion one demonstrates that the probability of securing exactly ten counties is greater than securing any other number given p = 0.90 for every county highpoint. Attempt Vermilion Peak immediately before Mount Lincoln this winter. Vermilion Peak comes with measurable avalanche risk - and, unless I can team with an expert in winter travel, along with the relevant gear, I cannot reasonably conscience this option. Climb Mount Lincoln but stop five feet short of the summit. Then, by summer, finish Colorado by first climbing Vermilion Peak and then Mount Lincoln. It will not, however, be a winter state completion. Free my mind from the entire concept of completing Colorado at a specific peak on a specific season. There are, however, certain benefits of just bowing to reason; climbing Mount Lincoln by winter; and finishing the Colorado highpoints in summer on Vermilion Peak. 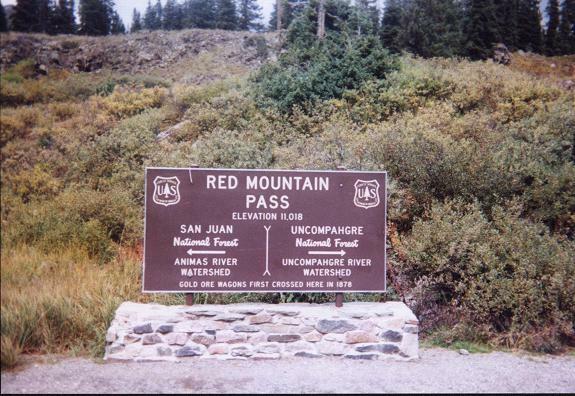 On that climb I would at-once complete Colorado; extend my home glob radius to 666 miles - a new record; and visit the highpoint of the county, San Juan, with the highest mean elevation (11,240 feet!) of any in the United States. One goal I had at summer's start was to finish the year with 350 total counties. At 348 counties I would meet the 80% mark for counties in the eleven contiguous, western United States (331). I met the latter goal but, at 349 counties (thanks to Vermilion Peak) failed to meet the former goal. Climbing Mount Lincoln before New Year's Day would settle the score on at least this matter. On this trip I hiked an estimated 147 miles, climbed 47,000 vertical feet, and drove 4,616.3 "Adam truck miles". One Adam truck mile is about one-sixtieth part greater than a statute mile, and is defined as 1.0 miles indicated on the trip odometer. The resulting ten additional counties raise my total county area to roughly 1,043,000 square miles. Finally, La Plata County, Colorado no longer limits my home glob radius. Instead, the new radius is 615 miles, being limited by (wouldn't you guess) San Juan County, Colorado.